Welcome to the website of the 2nd K.R.Ramamani Memorial National Taxation Moot Court Competition. Late.Shri.K.R.Ramamani was a legal giant in the field of taxation and was well known throughout India, especially in the south, for his legal acumen and expertise in the field of taxation. He was sought after by people from all walks of life for his expertise and advice for lawyers, accountants, industry leaders, celebrities or government officials. He nurtured and worked with, via the Subbaraya Aiyar, Padmanabhan & Ramamani (S.A.P.R) Advocates firm, dozens of lawyers in his time - most of whom are leading lawyers today. Even with his busy schedule, he found time to teach a popular course on taxation at the TNDALU for many years. He was on the Board of more than twenty listed companies and is fondly remembered by one and all for his saintly nature, kindness and humility. More information on Late.Shri.K.R.Ramamani can be obtained from his profile page. In a fitting tribute to Late.Shri.K.R.Ramamani, the TNDALU School of Excellence in association with S.A.P.R. Advocates has decided to start a national level taxation moot court from this year onwards. The aim of this Moot Court Competition is to be a high-quality event focused on taxation. The 2ndK.R.Ramamani Memorial Moot Court Competition is going to take place in the School of Excellence campus of the TNDALU in Chennai on September 17th & 18th, 2011. This event will be graced by sitting and retired Justices of the Madras High Court, President & Members of the Income Tax Appellate Tribunal (ITAT), leading legal luminaries, chartered accountants and of course law students and faculty. We have provided for both a Moot Court Competition and a Research Paper submission - both of which have large cash prizes and trophies. 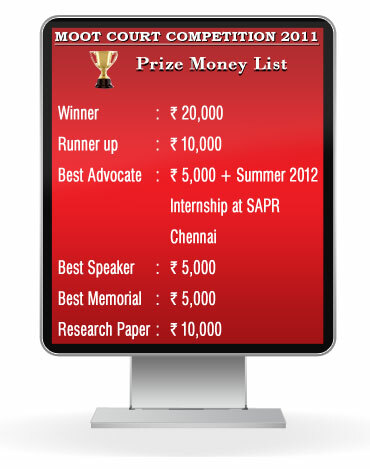 We also give out awards for Best Speaker, Best Memorial and Best Advocate; furthermore the Best Advocate awardees will be provided with a summer internship in S.A.P.R Advocates, Chennai in 2012. The field of taxation is highly complicated and needs considerable expertise. In recent years, with the opening up of our economy, there is a huge demand for expertise in the area of International Taxation especially in issues related to transfer pricing, DTAA's and cross-border tax planning schemes. There is enormous potential for law students in the field of taxation and we hope that this Moot Court Competition would go towards crystallizing interest in taxation in the minds of budding lawyers. Our aim is to create a Moot Court competition which stands the test of time and becomes an integral part of the calendar year for law colleges. With your support and co-operation, we intend to expand the scope of the K.R.Ramamani Memorial National Taxation Moot Court Competition in the coming years. We look forward to your participation and support. Feel free to contact us in case of any questions. © Copyright 2010 K.R.Ramamani National Taxation Moot Court All rights Reserved.